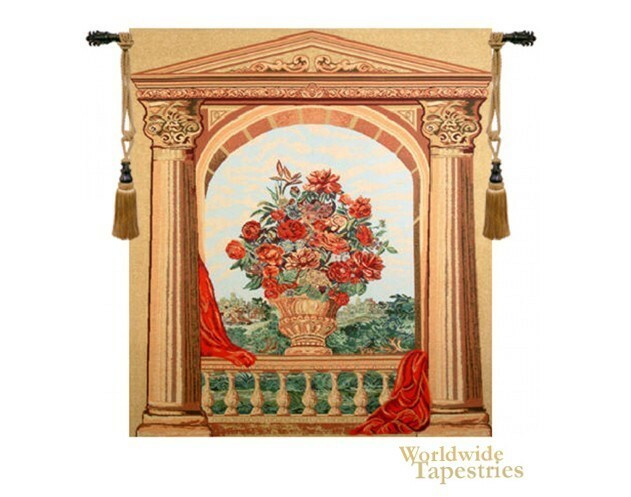 Based on classical style, the La Terrase tapestry shows an urn filled with red flowers, accompanied by a red drape. The subject of flowers in a vase and the red drape has been used in art as a symbol of palatial life. The Roman columns are seen on either side, and provides a frame for the countryside beyond. This La Terrase tapestry is backed with lining and tunnel for easy hanging. Note: tapestry rod and tassels, where pictured, are purchased separately. Dimensions: W 60" x H 52"